This is a sponsored post written by me on behalf of Daytona Beach Area Convention & Visitors Bureau. All opinions are 100% mine. 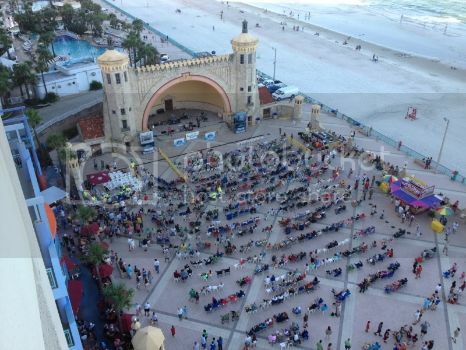 Did you know that Daytona Beach is the Festival Capital of Florida? 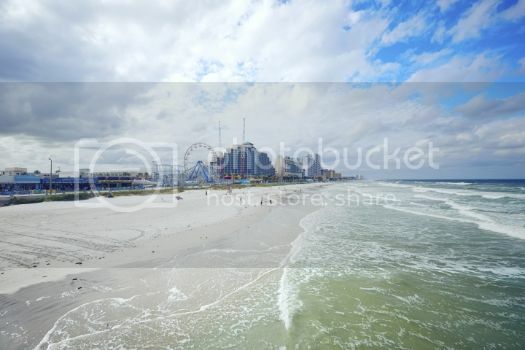 And that fall is the best time of the year to visit Daytona Beach? Coming up is the Daytona Blues Festival, Biketoberfest®, Daytona Beach Film Festival, Halifax Art Festival, and the Turkey Run. There’s also the Wings and Waves Air Show where over 40 different Air Force aircrafts give an amazing aerial performance over the Atlantic Ocean. Also, Daytona’s 23 miles of gorgeous sandy, white beaches are open to pedestrians all day – and all night long – seven days a week. Cars are permitted in designated areas of the beach from sunrise to sunset, tidal conditions permitting. Yes, you can drive your car right along the water’s edge! Not to worry, there are pedestrian-only beach areas, too! Travelers with disabilities or limited mobility can find beaches that are highly accessible. Daytona Beach’s unique Surf Chairs can be reserved at no cost, enabling you to experience the beaches and ocean waters without having to lug along your own equipment. To learn more about exploring some of the Daytona Beach area's more accessible locations, visit the Accessible Daytona Beach site. The site also provides a list of accessible hotel, restaurant, attraction and concert venues and includes tips for getting around. Daytona’s beaches are lined with great lodging options perfect for every family’s needs from camping to luxury resorts. There’s also small ins and bed & breakfasts. In Daytona Beach, there’s a large variety of lodging choices that should fit your family’s needs and budgets. Our family’s choice is usually a condo or vacation rental so the kids have their own rooms, and we can cook breakfast in and eat lunch and dinner out. Speaking of food, in October, Dine Around Daytona Beach highlights the best of Daytona Beach’s burgeoning restaurant scene. A new restaurant will be featured daily throughout the month of October on the Daytona Beach Area Convention and Visitors Bureau Facebook page and Daytona Beach Area Convention and Visitors Bureau Twitter channel. There are no prix fixe menus, just suggestions for great places to dine! If you’re visiting later in the year, you can enjoy traditional ethnic eateries, microbreweries, wine bars, fresh seafood, local produce, and your favorite national chains. No matter what you and your family are craving, Daytona Beach has you and your taste buds covered! There are many kid friendly options to choose from in Daytona Beach. For outdoor fun, you can go deep-sea fishing or rent equipment and spend the day splashing around in the ocean. The Daytona Beach area also has two, four-star golf courses as rated by Golf Digest. And there’s free things to do in Daytona Beach like taking the Angell & Phelps Chocolate Factory Tour, visiting the Southeast Museum of Photography, or taking a stroll through the Sugar Mill Botanical Gardens. On our family trips, we like to mix a little educational fare along with the fun stuff. If you have the same interests, Daytona Beach aims to please! You can visit historic sites, including two National Historic Landmarks: the Ponce de Leon Inlet Lighthouse and the Mary McLeod Bethune Foundation Home. Daytona Beach also has world-class museums and art galleries as well as theater and live performances. Daytona Beach has lots of great options for your perfect family vacation this fall. The beach awaits! Posted in Travel and tagged Florida on October 3, 2014 by Anne-Marie Nichols. Two summers ago we stayed in a small town just beyond Daytona Beach to the south. We drove through a number of time and I love the beach there. It goes on for miles and has a lazy summer feel to it. It’s easy to find long stretches with few other people as well. It seems a well equipped place with lots going on. We loved exploring there! The “off season” is such a great time to go and if you can get away, so is Thanksgiving!